Wrigleyville is the neighborhood directly surrounding Wrigley Field, home of the Chicago Cubs, and is located along North Clark and West Addison. Wrigleyville is officially part of Lakeview, located just South of Uptown. Some of Wrigleyville’s low rise brick building and homes are called Wrigley rooftops because they have rooftop bleachers where you can purchase a seat to watch a Cubs game without paying Major League ticket prices. You can be shopping then walk a block and find yourself surrounded by beautifully maintained yards and tree lined streets then be back in the shopping district again in another block. The area has been the backdrop for many Hollywood movies. It is also a very eclectic place, formerly a working class neighborhood that is now home to young professionals. Its close proximity to Lake Michigan and diverse social options are appealing to this younger crowd. Amid the tree lined streets sits rows of lovely houses in a variety of architectural styles. This is likely the other primary reason for this area’s popularity; one can buy or rent a gorgeous house on a gorgeous street, then walk for five minutes and be in the heart of the area’s premier shopping/nightlife districts. The best way to get around Wrigleyville is to walk. Almost everything is within walking distance and if you need to travel to other parts of the city, cabs are plentiful and the “L” station is conveniently located at Addison. There are no parking garages and street parking is minimal as most require a permit. Chicago Public Schools operates several facilities in the area including Blaine School, Burley School, Greeley School, Hamilton School, Lemoyne School, Nettelhorst School, Ravenswood School, Hawthorne Scholastic Academy, Inter-American Magnet School and Lake View High School. There are several private, Montessori and magnet schools as well to serve your child’s educational needs. During the baseball season, you can catch a Cubs game. Most come for a game and stay all night partying at the local establishments. Wrigley Field also has the reputation as Chicago’s largest singles bar! The area bars are more sports oriented than some of the bars and restaurants in nearby Lakeview East. The notorious Cubby Bar is directly across from the main entrance to Wrigley Field. Sluggers, Hi-Tops and Barleycorn bring in the crowds at the Clark and Addison intersection. There are also plenty of restaurants in this area for your dining pleasure. The Lakeview and Wrigleyville area has abundant shopping, restaurants, bars and clubs for every taste. 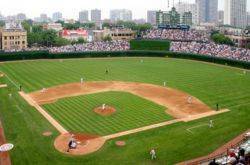 Besides the Cubs games, there is much to see and do in the Wrigleyville area. For those who live an active lifestyle, the shore of Lake Michigan offers bike and walking/running paths. These amenities are found throughout the community as well with bike paths on many of the major streets. If you enjoy time on the water, there is the Belmont Harbor marina which is home to the Belmont Yacht Club. Nearby Lake Shore Drive is host to the Chicago Marathon and the annual Bike the Drive bicycle event.